You land in prison in your twenties, faced with the likelihood of spending the rest of your life behind the wall. What do you do? Danner Darcleight started writing. He writes about what he sees, what he has done, and the toll that his own past actions have exacted. 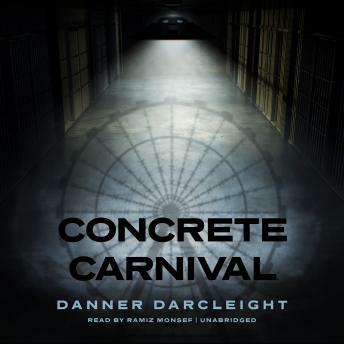 Concrete Carnival brings us inside a maximum-security prison, introducing a colorful cast of rogues while revealing the day-to-day struggles experienced by millions of Americans now living inside the world's largest prison complex. Haunted by his past, Darcleight slips the surly bonds of heroin. He gets stripped, deloused, and assigned an inmate number. He learns to navigate among sociopaths, gangbangers, drug dealers, hustlers, thieves, mercurial prison guards, and his own grinding remorse. He works through recurring thoughts of suicide, benefits from serendipitous encounters, and ultimately meets a loving woman who brings warmth to a harsh existence. Darcleight pushes past the clichés and caricatures employed by pop culture, offering direct engagement with what it's really like to do time. What begins as frontline reportage becomes an unforgettable case study in resilience and determination against the worst imaginable odds. An exhilarating, picaresque ride through the sights, sounds, and emotions of prison life, Concrete Carnival is a moving portrait of one man's long journey from hopelessness and addiction to love and redemption.